How Does The F-150 Raptor Compare To The 750-HP Shelby F-150? Both are modified F-150s, but they couldn’t be more different from one another. Who doesn’t like trucks with a penchant to kill everyone else on the road? We know we do. Hell, we , but thanks to a Ford’s own aim to choke out the aftermarket off-road truck tuners by means of that epic Baja mode-enabled F-150, the competition has only gotten wiser, more powerful, and better suited to a niche the Raptor has yet to conquer. We’re talking of course about aftermarket tuner Shelby, not the badge Ford licenses to use on its top tier Mustangs. And just like its founding father would have expected, this comes loaded with horsepower. 750 ponies of it to be exact, all extracted from the 5.0-liter V8 with a supercharger strapped on top. In order to give the Internet a better idea of how the rare Shelby truck stacks up to the Raptor, these two amateur reviewers go about putting the two trucks through their paces to see how each compares. The results aren't too surprising. Fans of sports cars will prefer the because it has lag-free horsepower, a 5.0-liter exhaust note with a supercharger whine no less, and of course, the racing stripes. 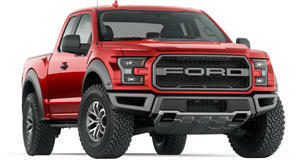 On the other hand, the Raptor has the off-road optimized technology and more authentic looks that don't scream boy racer. To each their own, but our solution would simply be to for a tune and enjoy the best of both worlds.